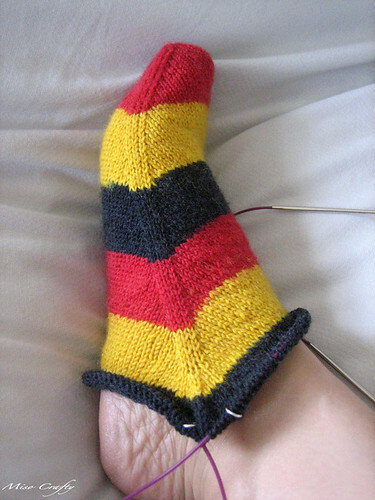 Miso Crafty Knits: WIP: Skews v.2 - German Styles! WIP: Skews v.2 - German Styles! I'm making true on my word and am knitting up another pair of Skews. I started these a few days before I left for Nelson so that I would have something small that I could throw into my purse and be able to work on while visiting family over a cup of coffee at one of the many coffeehouses in Nelson. While that thought was a lovely one, when you have a toddler running around there's no room for knitting while sipping a mug of hot java! Instead I worked on these late at night when the Munchkin was down for the night and during the ferry trips when Brett would take the little guy to the kids' play area. Which garnered a lot of weird looks from fellow ferry riders and workers alike. Brett laughed when I called it the traveling sock and thought I was referring it to the Ya-Ya Sisterhood. 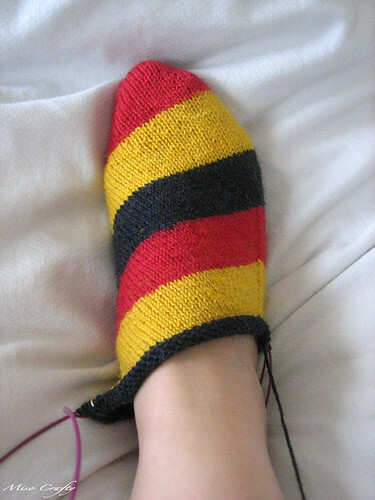 I also got a lot of comments and questions about the colourway, and people wanting to know if I was knitting the socks because of the World Cup or if I was cheering for Germany. To tell you the truth, 99.9% of the time I just smiled and nodded when really this was the colourway that I blindly pulled out of my stash of Regia sock yarn! 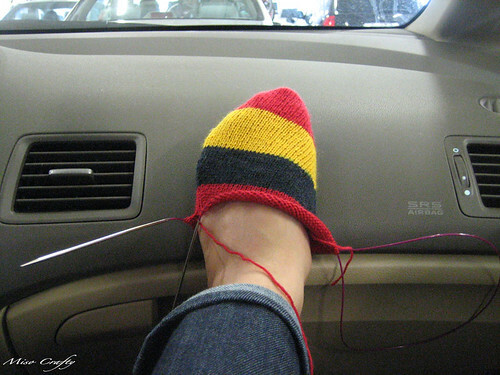 According to Brett knitting up socks in this colourway just shows the slow transition I'm making in becoming a Flames fan. Uh, no. I wonder if this is what the head honchos at Regia were hoping to induce when they decided to release the Nation Colour collection? It's not at all any bigger than the photo with the lifesaver. That's because I ended up having to rip out about 20 rows cause I wasn't paying attention or keeping track of my increases and was missing a critical stitch. 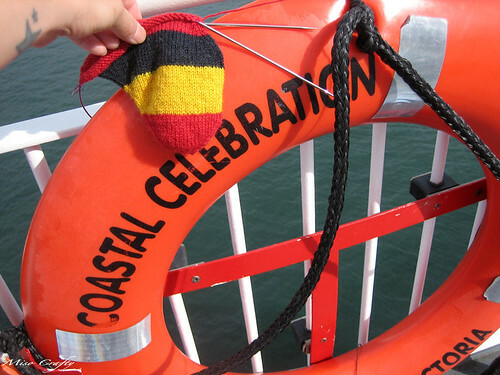 Needless to say, after finding my mistake 20 rows back I didn't have it in me to continue knitting the sock. Instead I opted to work on something else that didn't require much attention. More on that at a later date. Quite a lot of progress, don't you think? Considering that I've only worked on it for a total of maybe 4-5 hours over the course of a week? And what you don't see is the fact that I've been knitting up both socks at the same time, but on separate circulars (I shake my fist at the Second Sock Syndrome!!) and both socks are at the exact same spot in the pattern! How's that for knitting efficiency? Boo yeah! I'm hoping that these will be done in the next week or 2, granted that I don't start something new...which I'm really itching to do, now that I've got a whole whack load of new yarn to play with. But I'm über determined to at least finish Manu before casting on something new. Cross your fingers for me that I can get Manu done by the end of the month...before I go crazy and end up with a mad case of Starteritis! very nice! Thanks for the comment on my blog. We have not set a date yet but we are looking around October 2011. Problem is September/October is the busiest time for weddings here so some places are already booked out. If we need to we will move it earlier probably to August.